Our Culture Together Ensemble will be taking part in a professional concert at The Newbury Corn Exchange on Friday 24th May. It is hoped that this performance delivered in partnership with Southern Sinfonia and others as part of the new Berks Music Education Hub. Gael Music been working as part of the strategic group set up to oversee the governance structure of the new Berkshire Music Education Hub. This has helped us to further strengthen some of our existing partnerships from the original application with regard to two schools music centre days in Wantage and Newbury that will tie in with this performance. 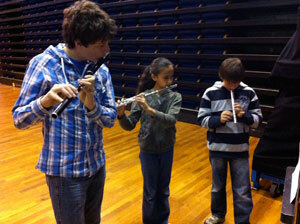 Wooden flute workshops at Newbury Corn Exchange from drop in sessions delivered in June.